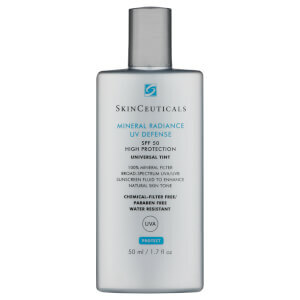 Protect your complexion from harmful rays with the water-resistant Sheer Mineral UV Defense SPF 50 from world-renowned leader in advanced science-based skincare, SkinCeuticals; a powerful broad-spectrum mattifying sunscreen that provides a high UVB and UVA protection. 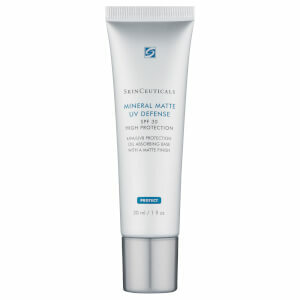 Evenly spreading on to skin, the quick-drying silky fluid is ideal for all skin types (including oily and sensitive skin) and is formulated with 100% mineral filters. Free from chemical-filters and parabens. Shake well before use. Apply just before exposure and re-apply frequently and generously to maintain protection especially after swimming, perspiring, or towelling. Aqua, Titanium Dioxide [Nano], Isododecane, Dimethicone, Undecane, C12-15 Alkyl Benzoate, Styrene/Acrylates Copolymer, Caprylyl Methicone, Nylon-12, Butyloctyl Salicylate, Phenethyl Benzoate, Tridecane, Dicaprylyl Carbonate, Silica [Nano], Triethylhexanoin, Isohexadecane, Dicaprylyl Ether, Talc, Dimethicone/PEG-10/15 Crosspolymer, Aluminium Hydroxide, Stearic Acid, Pentylene Glycol, PEG-9 Polydimethylsiloxyethanol Dimethicone, Aluminium Stearate, PEG-8 Laurate, Phenoxyethnol, Magnesium Sulfate, Caprylyl Glycol, Alumina, Polyhydroxystearic Acid, Disteardimonium Hectorite, Diethylhexyl Syringyldenemalonate, Tocopherol, Propylene Carbonate, Artemia Extract, Benzoic Acid, PEG-9. 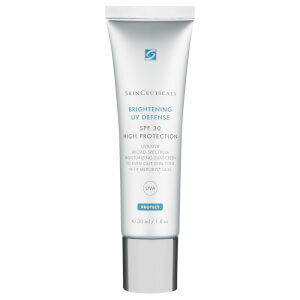 I really liked the texture of this sunscreen, not greasy. I recommend it it!